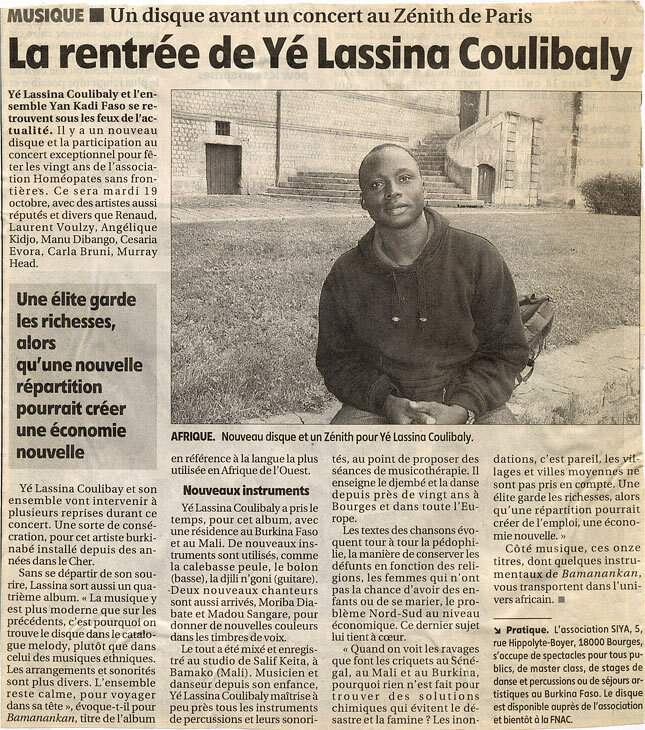 Listening to the world and respectful of African cultural heritage, that inspires him as an artist, songwriter, Ye Lassina Coulibaly’s music is surprisingly topical. Curious and attentive to contemporary and traditional musical forms, he reinventes African music through meetings with Western creators and bold artistic projects, without forgetting the voices of his ancestors. 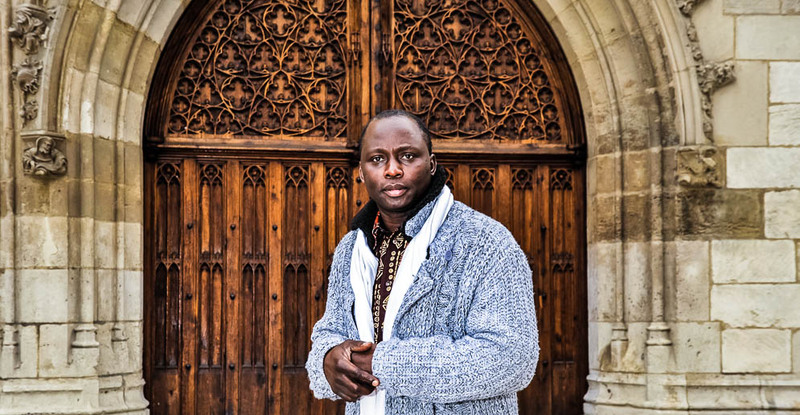 His research aimed at expanding melodic possibilities of traditional instruments of West Africa, led him to regular trips to Africa for work sessions with top musicians from Mali and Burkina Faso, always based on the Yan Kadi Faso band. The culmination of this musical journey is the creation in 2000 of a trio of young balafonists which the game is perfectly suited to his musical research. The formation of this trio also meets his commitment to train young artists. 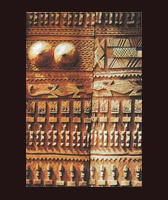 Since 2000, many songwriting residency in Bobo-Dioulasso, in Burkina Faso have allowed artists to develop other techniques as pentatonic balafon. The daring game of the trio of balafon is based on the use of chromatic balafon with a suitable fabric of the instrument so that it produces different note pitches absent from the instrument usually made. Thus, the trio repertoire evolves into chromatic scale. The atypical use of this scale of notes, produces catchy and delightful melodies that will enchant more than one ear, even blasé. 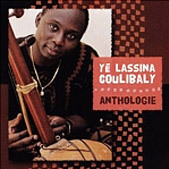 This wonderful musical result, driven by the enthusiasm and joy of the musicians to share their artistic discovery outside the agreed musical paths, reinforces Ye Lassina Coulibaly artistic choices whose faith in the ability of African music to win large audiences in beyond Africa’s borders and diasporas has never wavered. 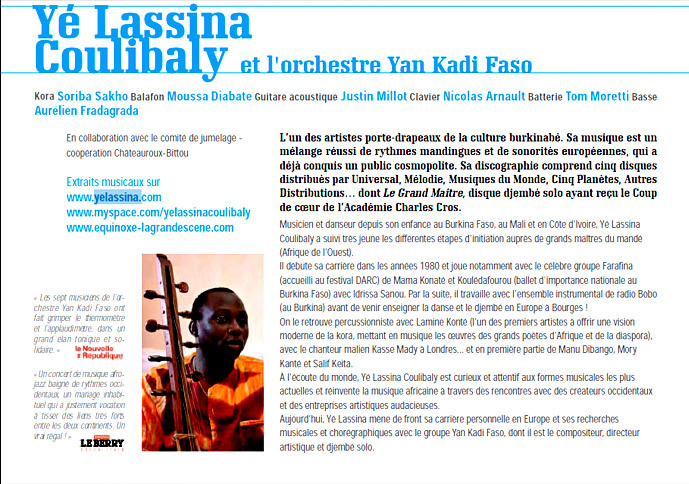 The Yan Kadi Faso band values one of the recent Ye Lassina Coulibaly’s creations that forms the trio of balafon. 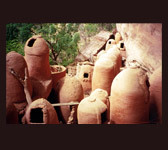 The repertoire consists entirely of original creations, inspired by the course of life, the joys and hardships of everyday life, the values of African wisdom carrying beneficent breath of the ancestors. The repertoire of the trio, however, can easily be tamed, emotions that gives this music may overcome any cultural barriers. This field thus opened, offers a unique latitude of reinterpretation of varied musical repertoires, from jazz to Hip Hop through the French song and many other musical genres. This artistic approach opens the door to a rich artistic and cultural dialogue. A hypnotic and mesmerizing musical form and a musicians’ perfect interpretation! We are looking for creative centers, structures that host residency, domestic stages, foundations that promote artistic encounters.